Use in windy and exposed conditions. Helmet comes complete with a terylene cradle. Vabon sweatband and ventilation holes and slides for extra comfort. Conforms to EN 397. 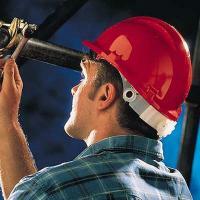 This helmet has been designed especially for use in windy and exposed conditions.